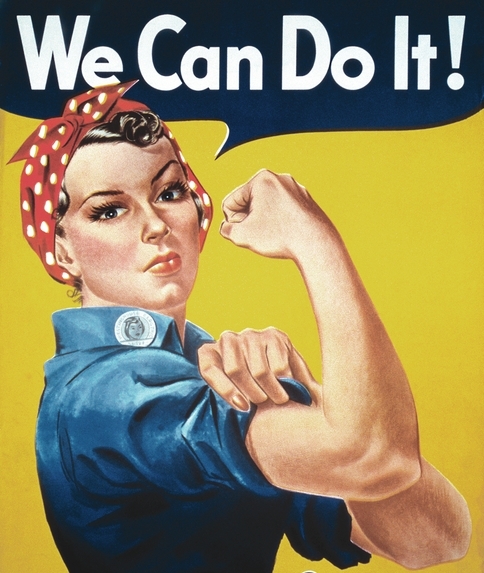 Among the most famous images from the World War II era, the "We Can Do It!" poster of a determined working woman (colloquially dubbed "Rosie the Riveter") has been reproduced thousands of times since its original appearance in 1942. During the war, thousands of American women entered the job market for the first time, many in munitions factories or other industries directly related to the war effort. Many women found their wartime roles in jobs previously reserved for men to be a source of increased independence and pride, and for many their experiences formed the foundations for later struggles for equal pay and an expanded role for women in the workplace. Thus "Rosie the Riveter" has become a feminist icon to many in the years since her original incarnation. Source | J.Howard Miller, "We Can Do It," poster, produced for Westinghouse/The War Production Co-Ordinating Committee, 1942, National Archives, Powers of Persuasion, http://www.archives.gov/exhibits/powers_of_persuasion/its_a_womans_war_too/images_html/we_can_do_it.html. Cite This document | J. Howard Miller/War Production Co-Ordinating Committee, “"We Can Do It! ",” HERB: Resources for Teachers, accessed April 22, 2019, https://herb.ashp.cuny.edu/items/show/1192.